The 4.19 million iPads Apple sold in the third quarter is a huge number, surpassing record Mac sales of 3.9 million—up 27% over last year. Even hugerer: 14.1 million iPhones in those three months alone. That's nearly double what they sold in the fourth quarter of 2009. That $20 billion revenue was a record for the company, as was the staggering $4.3 billion profit. If these are the numbers before the holiday season, I can't wait to hear what kind of guidance they're about to give. The call to discuss earnings starts at 5 EST; we'll update as warranted then. Apple basically sold as many iPhones as they could make, meaning that 14.1 million number isn't even as high as it could have been. There have been over 125 million iOS devices (iPhones, iPads, iPod Touches) sold. iOS 4.2 is still on track for November, with wireless printing being a focal point. There are now over 35,000 iPad apps alone in the App Store. We sold 14.1 million iPhones in the quarter, which represents a 91% unit growth. It handily beat RIM's 12.1 BlacBerrys sold. We've now passed RIM, and I don't see them catching up with us in the foreseeable future. They must move beyond their area of comfort. I think it's going to be a challenge for them to convince developers to create apps for them. But what about Google? Eric Schmidt said they were activating 200,000 Android devices per day. Apple has activated a peak of almost 300,000 per day. We hope manufacturers will soon start reporting how many Android phones they ship. Google loves to characterize Android as open and iOS and iPhone as closed. We find this as disingenuous... Android is very fragmented. Many Android OEMs... install proprietary user interfaces... the user is left to figure it all out. Compare this to the iPhone, where every device works the same. Open systems don't always win... In reality, we think the open versus closed system just clouds things for the customer. The real issue is "fragmented" versus "integrated." We see tremendous value in having Apple, rather than our users, be the system integrator. We believe integrated will trump fragmented every time. On the "avalanche of tablets coming: it appears to be a handful of credible products. They also appear to be largely 7-inch screens, unlike Apple's 10-inch screen. A 7-inch screen is only 45% as large as Apple's iPad screen... There are clear limits of how close you can place elements on a touch screen before users can't tap, pinch, or touch them. The 7-inch tablets are tweeners: too big to compete with a smartphone, too small to compete with an iPad. Even Google is telling manufacturers not to use Froyo, and to wait for a special tablet release next year. 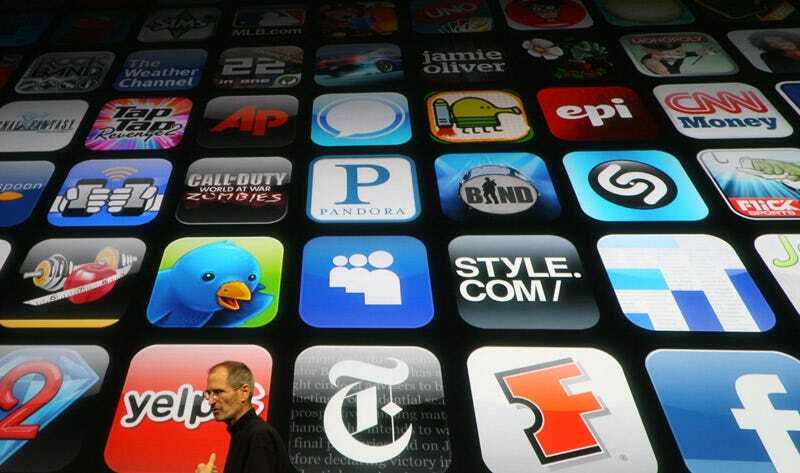 iPad now has over 35,000 apps on the iPhone. This new crop of tablets will have zero. Our potential competitors are having a hard time coming close to the iPad's prices, even with their far smaller, not as nice screen. This is why we think the current batch of tablets will be DOA, dead on arrival. Competitors will switch to 10-inch form this time next year. "Sounds like lots of fun ahead." The iPad is clearly going to affect notebook computers. The iPad proves it's not a question of if, it's a question of when. We're already seeing tremendous interest in education and much to my surprise from business. We've got the tiger by the tail here. This is a new model of computing. Q: Any thoughts on Flash? SJ: Flash memory? We love flash memory. Flash hasn't affected us at all; most of the video on the internet is HTML5... We have a very good product here that's tough to match... we priced iPad pretty aggressively. We're out to win this one. I think right now it's a battle for mindshare of developers, and a battle for the mindshare of customers. Right now iPhone and Android are winning that battle. Q: How is Apple TV doing? SJ: We have gone to a streaming model on Apple TV. It's complete streaming. All the content is rented from the iPhone 4 or streamed from your computer, or streamed from your iPhone or iPad with AirPlay. So how is our new model of Apple TV doing? In a very short amount of time we've already sold 250,000 of them. I think it's a great product, and it's $99 price point is very enticing. SJ: Nokia's the biggest, and they're good at what they do. But we don't want to be like them. Android is our biggest competitor. They outshipped us for the first time as we were transitioning to iPhone 4. We're waiting to find out what happens in this quarter. One of these days we'll eventually learn. I imagine we'll be competing with them for quite some time, but we have very different approaches. We believe in our approach very strongly. Q: Share versus price points? SJ: Nokia makes $50 handsets, and we don't know how to make a great smartphone for $50. So our goal is to make a breakthrough, great product. Make the best products in every industry that we compete in and to drive the costs down while constantly making the products better at the same time. That's what we did with iPod. Offer more functionality at the same price or sometimes at a lower price. We have a very low market share in the phone market, and we have a very high market share now in tablets because we're the first mover. But we don't think about it that way. The reason we wouldn't make a 7-inch tablet isn't because we don't want to hit a price point, it's because we don't think you can make a great 7-inch tablet. Software developers aren't going to deal real well with all these different products where they have to resize their software... We're all about making the best product at aggressive products. You're looking at it as a hardware manufacturer that doesn't know a lot about software, and you're sitting around saying how can we make this cheaper? You can make it smaller and put a slower processor on it and less memory, and you assume that the software will somehow come alive on this product you're dreaming of, but it won't. These app developers... most of them will not follow you. Most of them will say I'm sorry, but I'm not going to write a watered down version of my app just because you've got this phone that costs $50. Q: Why aren't you more interested in buybacks of dividends? SJ: We strongly believe that one or more strategic opportunities might come along, and we'll be in a unique position to act because of our cash position... I think that we'd like to continue to keep our powder dry because we do feel that there are one or more strategic opportunities in the future. Q: Why do you have a pricing advantage on the iPad? SJ: I think so much of it is because we do the engineering ourselves. We've learned a lot on everything we've done, from the miniaturization on iPod and iPhones. I think we've learned a lot, we've developed a lot of our own components where others have to buy them on the market with middlemen getting their cut. We're systems architects and know how to build things in very efficient ways. This is a product we've been preparing for for a decade. CUPERTINO, Calif.—(BUSINESS WIRE)—Apple® today announced financial results for its fiscal 2010 fourth quarter ended September 25, 2010. The Company posted record revenue of $20.34 billion and net quarterly profit of $4.31 billion, or $4.64 per diluted share. These results compare to revenue of $12.21 billion and net quarterly profit of $2.53 billion, or $2.77 per diluted share, in the year-ago quarter. Gross margin was 36.9 percent compared to 41.8 percent in the year-ago quarter. International sales accounted for 57 percent of the quarter's revenue. "We are blown away to report over $20 billion in revenue and over $4 billion in after-tax earnings-both all-time records for Apple"
"We are blown away to report over $20 billion in revenue and over $4 billion in after-tax earnings-both all-time records for Apple," said Steve Jobs, Apple's CEO. "iPhone sales of 14.1 million were up 91 percent year-over-year, handily beating the 12.1 million phones RIM sold in their most recent quarter. We still have a few surprises left for the remainder of this calendar year." "We're thrilled with the performance and strength of our business, generating almost $5.7 billion in cash flow from operations during the quarter," said Peter Oppenheimer, Apple's CFO. "Looking ahead to the first fiscal quarter of 2011, we expect revenue of about $23 billion and we expect diluted earnings per share of about $4.80."